Every Sunday from 10am – 4pm. Stallholders set up between 9am – 10am, and pack up between 4pm – 5pm. At the Bondi Markets we welcome arts, crafts, handmade items, clothing, accessories, jewellery, bric-a-brac, art, photography, furniture, salvaged items, food, records, CDs, DVDs, vintage clothing and re-claimed or re-purposed pieces… the list goes on. The Bondi Markets have a reputation as a place where quite a few very successful independent designers first started selling their work. Our main focus is providing independent designers a platform to showcase and sell their work. Many creative entrepreneurs use the Markets as a place to test their ideas before expanding. You cannot sell live animals, drugs, fake or counterfeit items at the Bondi Markets. Basically, if it’s illegal, offensive or dodgy then we won’t have it at the Market. Can I Have a ‘Garage Sale’ at the Market? You are welcome to come down to the Market and sell things you no longer need or want. 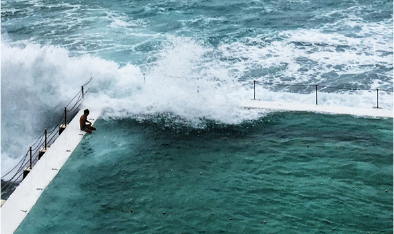 Clear out your cupboard or your garage and enjoy a day in the sun with the Bondi locals. Stall Fees vary depending on which section of the Market you elect to trade in. Stall sizes may vary slightly but are generally 3.0m X 3.0m. We have a number of larger premium stalls available of varying sizes. Info on price and availability of these stalls is available upon request. *please note cancellations need to be emailed to the office on the Sunday prior to the market day you are booked and paid to attend. Cancellations made after this time will not be accepted. Power is $10.00 for 10amp point - ONLY available to Food Stalls! If you do not have your own public liability insurance cover, your stall fee will be increased by $10.00. You will be covered by the Market Public Liability Insurance Policy, which provides $20,000,000.00 cover with a $5,000.00 excess payable by the stallholder. If you already have public liability insurance cover, please bring a copy of your public liability insurance certificate and show it to the staff when you are being allocated a stall. As a regular stallholder, you need to bring the certificate with you each week. No paperwork, no discount! Please note it is a strict requirement that stallholders have a public and product liability policy with a minimum of $10,000,000.00 cover in the stallholder's name if the stallholder offers for sale any of these products: second-hand electrical goods and toys, cosmetics and beauty products, medicines, potions, oils, fragrances and soaps, massage services or food products. Please scroll down to submit an application to become a stallholder. We expect stall applications to be presented in the same manner as if you were applying to a prospective agent, wholesaler or retailer. We’re going to be selective, and we expect our stallholders to be an asset to the Markets. In your application, please send us photos of your product, your stall set up, a website link, Facebook page, Instagram handle and anything else you think will help communicate your brand ethos and the products you will be selling. If your stall is not approved or waitlisted, it may be because we have similar products already at the Market, and you may re-apply in 6 months time. We are careful not to have an overlap of products, and are currently looking for unique traders who will bring something interesting to our Market. If your application is successful and you have paid your stall fee, your stall location will be posted on our website on Friday at 5pm before each market. Market dates are made available 3 week in advance. New market dates become available every Sunday. -Follow this LINK to the login page and enter your username and password. -Select the Market date you are interested in, the stall type, and then click apply. -If we have a place available for you for that month, you will be sent a ‘Payment Request’ email. -If there isn’t a place available, you will also be notified via email. -To finalise your booking, your payment will need to be made by the due date. -Login in to your stallholder profile via this LINK and click on the “My Requests” icon. -To make your payment click on “View and Pay”. Please check your payment details and click “Make Payment”. -You will then be given the option of making a payment via your PayPal account OR by entering your credit card details. -Please note that you must pay to confirm your booking and payments are not transferable if you do not show up. What Does it Mean to be a Regular Stallholder? As a regular stallholder, you will not need to book each week. A fixed stall space will be held for you unless you cancel beforehand. All cancellations must be received (by email) a minimum of seven days in advance. Your regular stall will be held for you until 10am on Market Day. After this time, your spot may be given to casuals or standbys. A regular stallholder has the advantage of a fixed regular position, so customers can get to know where to find you and you can begin to build customer loyalty. Regular spots are generally the best locations in the Market and most of these spots allow stallholders better locations to load and unload. If you wish to become a regular stallholder, please speak to the Manager. We will review your stall offer and consider whether it may be included in the mix of stalls and stallholders who are already regulars. -NSW Food Authority Food Safety Supervisor Certificate (NSWFA requirements for a temporary food stall can be found here). -Waverley Council Temporary Food Stall Permit (Apply here). We are happy for traders to gain approval for their product before applying for the Waverley council permit. Attendance will then be pending Waverley Council food permit approval. All rubbish, waste and packaging must be taken away by the stallholder. Bins provided do not cater for stallholder rubbish. The stall site must be left in the condition it was found. The Market is conducted in the open air and will operate in varying weather conditions including wet weather. It is the responsibility of the stallholder to bring their own covers, weights to hold down equipment and other equipment for the purpose of protection against adverse weather conditions. The Market will not be cancelled and no credits or refunds are issued in the event of bad weather. Please do not apply for a stall unless you are prepared to take the risk on weather. All the answers you’ve been looking for. This phone is only in use on Sundays. At all other times please call our office, or email us for a faster response.